Some of my instruments have been engraved. Can you re-polish them? Yes, our Repair Services department is able to re-polish instruments made of stainless steel. Simply send them in to us with an order form to request an estimate. Do you repair all surgical instruments? Yes, we repair all surgical instruments, provided they are very well made – of German manufacturing, for example. It’s often not economical to repair instruments manufactured elsewhere, like in Malaysia, China, Pakistan, Russia, etc., as the cost often surpasses that of a new instrument. Purchasing instruments manufactured in Germany remains a profitable choice. How do I find pricing when I visit your website? Very easily. At the top of the home page (https://www.instrumentarium-online.com/ca_en/customer/account/login/), simply click on LOG IN/REGISTER. Once you’ve registered, we will confirm your online account and you’ll have access to our pricing. How do I find out about maintenance and sterilization procedures for your instruments? On our site, under the MAINTENANCE & REPAIRS tab, you’ll find all the necessary information (https://www.instrumentarium-online.com/ca_en/maintenance). Through using the “Wish list” icon, and typing in everything you want to order. Don’t forget to click on “Submit.” You can then send us your list via email (info@instrumentarium-online.com), fax (450.471.1030), or call it in to us (1.800.361.1502). When I receive my order, if some instruments are out of stock, how do I go about confirming a delivery date? Although we manage our inventory well, at times some instruments are out of stock. Should this occur, simply contact our Customer Service department, and we will be happy to assist in confirming an approximate delivery date. Telephone: 1.800.361.1502 or 450.471.1379, Email: info@instrumentarium-online.com. My delicate instruments often get scratched after sterilization. Is there something I can do about this? Prior to sterilization, we strongly recommend protecting all pointy and delicate instruments with flexible vented silicone caps. For further information, contact us at 1.800.361.1502 or 1.450.471.1379, or email us at info@instrumentarium-online.com. My instruments become magnetized following some types of surgery. How can I rectify the situation? We can easily demagnetize them. Simply send them to us, along with an order form for repair, to 1273 rue St-Louis, Terrebonne, Québec J6W 1K6. To prevent this problem for such types of surgery, you can use a skid-proof, non-magnetic and latex-free holding drape (cat. #: HB.9150.12 or HB.9150.24), to ensure that instruments don’t slide, fall or become magnetized. You can order one by phone (450.471.1379 or 1.800.361.1502) or email (info@instrumentarium-online.com). How do I know if my needle holders need to be repaired? In order to determine if your needle holder needs to be repaired, close it to the first ratchet position. If you see light between the jaws, the inserts need to be changed. Consult us at 1.800.361.1502 or 450.471.1379, or via email at info@instrumentarium-online.com. Do your instruments have a lifetime warranty? Lifetime warranty, according to whom? The lifetime warranty of an instrument is always against any manufacturing defects, and provided that the instrument has been used for its intended purpose. Beware of the false representations out there! My instruments are stained – what do I do? The colour of a stain – blue, black, brown – or if your instruments are discoloured, indicates the cause of the stain. Good-quality instruments and materials are rarely the cause. Regardless of the case, there are causes – and especially – solutions. We invite you to consult Pages 44 to 47 in our Practical Guide (https://www.instrumentarium-online.com/media/pdf_catalog/77.1464363791.pdf). Aside from the price, what are the real differences between German stainless steel and the other types? Various types of stainless steel exist. It’s essential to choose the right one for the longevity of the instrument. German manufacturers select the type of stainless steel, and especially, the mode of manufacturing, based on the nature of the instrument to be manufactured. This approach is unique to them. Manufacturers of other countries, like Indonesia, Pakistan and China produce all of their instruments without accounting for this important detail. How do I deduce if my new instruments are of good quality (German quality)? All new instruments have the appearance of quality tools. They should all be marked as “Germany stainless,” but unfortunately, and very often, it’s only through usage that we can truly determine the quality. Price is a good indicator. Abnormally low pricing automatically signifies that your instrument was not manufactured in Germany, and therefore will not last as long. Your instrument will also not be corrosion resistant, and worse yet – sterilizing it alongside quality instruments will ruin them, leading to repair needs for other instruments. In addition, the lifespan of your cheaper instruments is very limited compared to that of quality instruments. The saying “you get what you pay for” also applies to purchasing surgical instruments! With budgetary cutbacks, I don’t have time to verify the condition of my instruments. Do you offer a service to assist me with this? Send us your instrument trays, along with a repair order form, to refurbish your surgical instruments. Following a verification of your instruments by our Repair Services department, we will send you an estimate, for your approval prior to proceeding with repairs. We would like to take inventory of our stock of surgical instruments. Do you offer this service? We have been cultivating our expertise with regards to surgical instruments for over 40 years. With 15 to 25 years of experience, our representatives are highly qualified to offer this type of work. 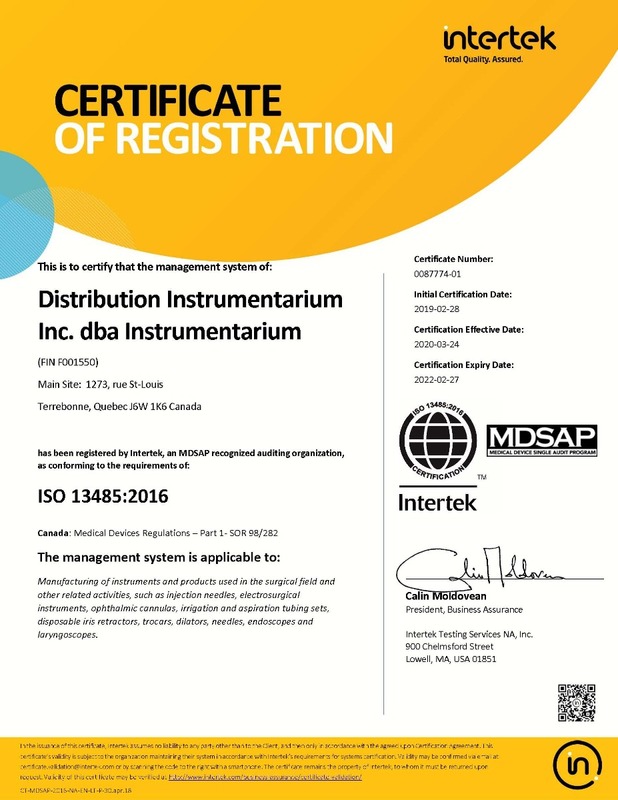 Simply contact us at 1.800.361.1502 or 450.471.1379, or via email at info@instrumentarium-online.com, for further details. Do you repair surgical instruments made by your competitors? We repair all surgical instruments. We do warn you, however, that it’s not economical to repair low-quality instruments. Nevertheless, we can offer you a discount on a good-quality exchange or replacement. You always have the last word with regards to accepting or refusing our offer. If I don’t have the catalogue number for an instrument, or if I have a competitor’s catalogue number for an instrument that I wish to purchase, can you assist me? Yes. We can assist you – no problem. You can reach us by phone (1.800.361.1502 or 1.450.471.1379), fax (1.450.471.1030), or email (info@instrumentarium-online.com). We also invite you to consult our website, and click on the “Look up similar products made by other brands” tab. Regarding the ad I received about your 2-year maintenance warranty for new Instrumentarium brand instruments, does the warranty apply to all instruments sold by your company? Yes. The warranty applies to all instruments sold by Instrumentarium, for a duration of 2 years – regardless of whether or not they are made by Instrumentarium or any of the other companies that we represent.